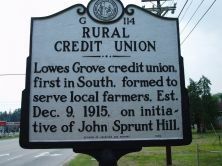 Lowes Grove credit union, first in South, formed to serve local farmers. Est. Dec. 9, 1915, on initiative of John Sprunt Hill. The credit union movement has its roots, in part, at Lowes Grove, once an agricultural community in Durham County, today enveloped by the burgeoning Research Triangle Park. The first credit union in the nation opened in 1909 in Manchester, New Hampshire. The objective of credit unions embodied self-help and economic democracy, ideals identified with Progressive philosophy. But the day-to-day practical application was to relieve borrowers of high interest rates, often over forty percent, charged by bankers and other moneylenders of the day. Durham banker John Sprunt Hill envisioned the application of the credit cooperative concept to agriculture. 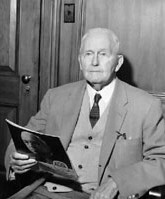 Farmers, crippled by lack of access to credit and a burdensome crop lien system, could benefit most from credit unions, Hill foresaw. In 1913 he travelled to across Europe as part of a commission appointed by President Woodrow Wilson to study credit practices in place since the mid-1800s. In Vigonova, a village in northern Italy, he found particular inspiration. On his return Hill spoke widely, in and out of the state, on rural credit unions. Hill was the guiding force behind a bill passed by the legislature in 1915 to authorize their charter. Through his initiative a meeting was called at the farm life school at Lowes Grove on December 9 of that year. There, sixteen farmers subscribed to stock for the cooperative. The credit union, offering six percent short-term loans, opened for business on January 20, 1916, followed five days later by one at Bahama and the next month by two in Mecklenburg County. 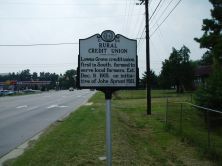 A trade journal in July 1916 identified the Lowes Grove credit union as the “first cooperative credit union, operating under legislative sanction, established in the South.” Credit unions, which underwent their greatest growth after the Depression, were supervised by the state Department of Agriculture until recent years.